As with many collections the start of the Historical Museum of Early Oil Days began with no insight into what it would eventually become. This particular collection of petroleum memorabilia began in 1983 with an old Wayne visible that was destined to be thrown away when the warehouse in which it neglectedly stood was slated to be renovated into office space. Glenn Zirkle confiscated the pump in the absence of anyone else knowing about it (most would describe this as “stolen property”) and went about the process of finding the missing parts, restoring the pump and then surprising the founder of the company, R.W. Dyke, with it as a Christmas gift that year. The pump was graciously put on display in the founder’s office and received so many compliments that Zirkle began watching for pumps in his travels around the states of Oregon and Washington. The great fun about this hobby was it afforded Zirkle the opportunity to participate in two of his favorite hobbies at the same time – riding motorcycles with his youngest son Gabriel and looking for pumps out on farms and back country roads. In 1985, Zirkle had the opportunity to follow up a tip on a pump allegedly stashed away in a side barn next to a warehouse in Portland and sure enough a Bowser clock face was purchased for $65. This began an obsession of going back to locations where other pumps had been seen only to discover that many had been acquired by other collectors. Through the years and with many a long conversation, clock face, visibles, pre-visibles, display pumps and three wheel computer pumps were acquired, not a few for the handsome price of $50! 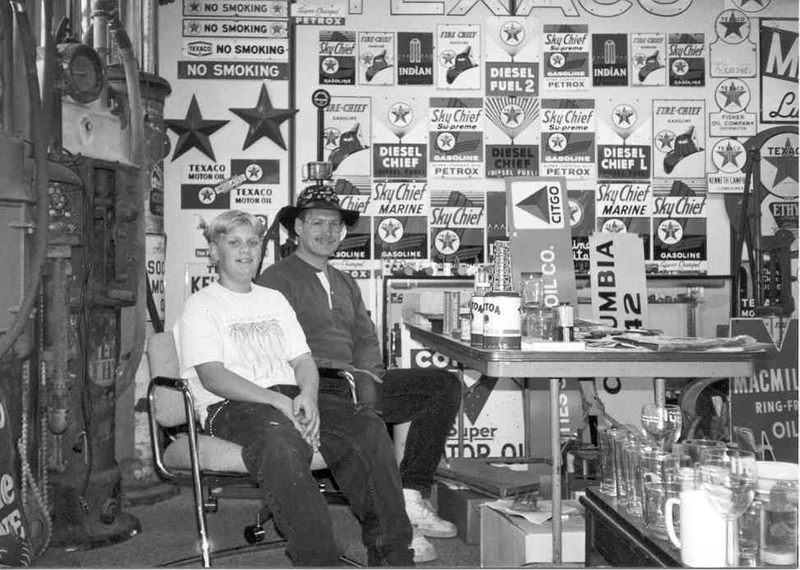 In the late 80’s Jay Morgensen came into the picture and gave Zirkle an understanding about porcelain signs. Things like grade “8” or better, how to identify reproduction signs, how to spot touch ups that had been done to “original” signs and how to recognize “aged” signs. So many things to learn and so little time to collect! The training was good and the results were worth it. Over the years the collection amassed over 1000 signs, pumps, oil cans, oil racks, give away items from many oil companies, etc. The years took us to many a unique and distant place with many wonderful people to meet, swap with, share stories, buy from and sell to than this collector would have ever imagined.